A myringotomy is a procedure to put a hole in the eardrum. 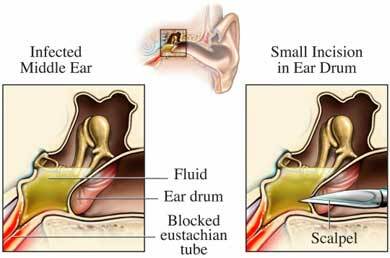 This is done so that fluid or infection trapped in the middle ear can drain out. The fluid may be blood, pus, and/or water. In most cases, a small tube is inserted into the hole in the eardrum. The tube helps to maintain drainage. General anesthesia is most often used. You will be asleep. In some cases, a local anesthetic will be used to numb the ear. No stitches will be used to close the incision. The incision will heal itself. The procedure is often done on both ears. Some doctors may use a laser beam to make the opening in the eardrum. Anesthesia will prevent pain during surgery. Pain and discomfort after the procedure can be managed with medications. Lidocaine ear drops may also be given to decrease pain. Replacing cotton in the ear canal used to absorb postsurgical drainage. Using ear drops a few times a day. Monitoring your ear for drainage if water gets inside your ear. Using ear plugs while swimming or bathing. Avoiding underwater swimming and diving until further notice. Not cleaning your ear after surgery or placing anything other than ear drops, cotton, or ear plugs into your ear. If ear tubes are inserted, you may feel popping, pulsation, clicking, or minor pain when burping, chewing, or yawning until the ear heals around the tubes. Complete healing without complications should occur within 4 weeks. If ear tubes were inserted, they typically fall out within 6-12 months. In some cases, surgery to remove the ear tubes may be necessary. Most eardrums heal normally after tubes come out, but visible scarring is not unusual. Acute otitis media (AOM). EBSCO DynaMed Plus website. Available at: http://www.dynamed.com/topics/dmp~AN~T116345/Acute-otitis-media-AOM . Updated May 16, 2017. Accessed August 29, 2017. Myringotomy and PE tubes. Baylor College of Medicine Department of Otorhinolaryngology and Communicative Sciences website. Available at: https://www.bcm.edu/healthcare/care-centers/center-hearing-balance/procedures/myringotomy-pe-tubes. Accessed August 29, 2017. Myringotomy and Tubes. The University of Chicago Children's Hospital website. Available at: http://d3qi0qp55mx5f5.cloudfront.net/comer/i/basic%5Fpages/Myringtomy%5Fwith%5FTubes%5FPostoperative%5FInstructions.pdf?mtime=1500997217. Accessed August 29, 2017. Otitis media with effusion. EBSCO DynaMed Plus website. Available at: http://www.dynamed.com/topics/dmp~AN~T115313/Otitis-media-with-effusion . Updated September 18, 2016. Accessed August 29, 2017. Rosenfeld RM, Schwartz SR, Pynnonen MA, et al. Clinical practice guideline: Tympanostomy tubes in children—executive summary. Otolaryngol Head Neck Surg. 2013;149(1):8-16.